I’m pleased to announce that The Little Bit Project’s Bridge Program kicked off on Sunday, March 5th. The purpose of the program is to provide various life-skill workshops to women preparing to complete a residential treatment program and resume their lives outside of the facility. The participants of the program are currently residing at Naomi’s Nest in Highland Park, Michigan. Although I originally wanted to work with 15 or more women at a time, that did not happen. Between scheduling conflicts and other life happenings, the first group of 15 ladies I selected were no longer in the facility. I returned to Naomi’s Nest at the end of February and re-administered the interest/needs survey to women who were willing to participate. This time I ended up with 12 names – and I was excited about really getting the program off the ground. When I returned last Sunday for our first meeting, only half of the ladies who were interested in participating the week before were still open to being a part of the group. Six ladies. I was very disappointed, but still determined. And the enthusiasm with which those six ladies left from their group meeting to join me put a smile on my face. Once we got to the Phoenix Room – the room selected for us to hold our meetings - the ladies shared that there was some type of confusion going on between some of the residents and they were glad to be able to remove themselves from that for a while and get some positive energy. We started with introductions. All of them shared some of themselves with me. Each person listened intently and respectfully to the others. I was feeling better and better about having just six people. I listened with my heart wide open to all of them. And the more I listened I realized that this could be any one of the people I know. It could even be me. Which of us hasn’t made a bad decision at some point in our lives? For many of them, just one bad choice led them to where they are right now. Towards the end of the introductions, one of the women had a breakthrough. She opened up and shared the reasons she started using drugs and how they ruined her relationship with her family. She talked about not wanting to be a disappointment or embarrassment to her grown children any longer. And she cried. We all shed a tear or two for her. And the other ladies told her everything would be fine. They said she was doing her part because she was getting help and in recovery. My heart broke for her. I hope this program helps her and the other five women where they want to be. After we all regained our composure, I let the ladies know that this this program was created with them in mind. I wanted them to learn some skills they could use to help they stay on the right track once they leave treatment. I wanted to help them feel better about themselves, their abilities, and their potential. I think they could feel that. When they returned from a break, I asked them to complete a short and simple self-esteem assessment. I want to be able to see how they feel now and compare it to how they feel at the end of our time together. We talked about the speakers I have lined up to come in to speak with them over the course of the next few weeks. Our workshops will include health and wellness, parenting and family relationships, money management, and spirituality. They seemed to be ready to take it all in and were eager to receive all that was to be shared with them. The last thing I gave them was a journal workbook – filled with writing topics and spaces to write. These are the same topics used in The Little Bit Journaling Challenge at the end of the year. All of the feedback I got about the topics in the challenge was great. 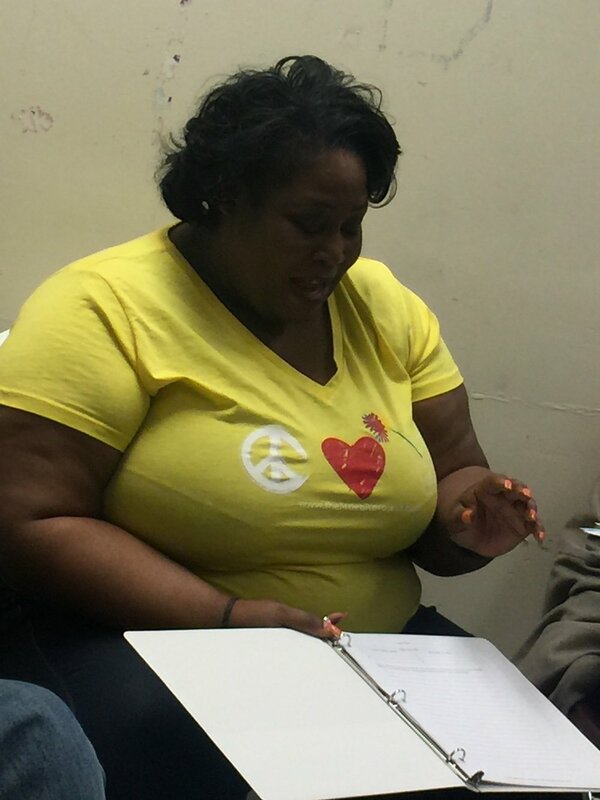 Each participant talked about how much they learned about themselves and how much they grew. One person who a part of the challenge worked with women in treatment and thought the ladies in The Bridge Program would benefit from it – so I put it together and presented it to them. That was by far the thing they were most excited about. They couldn’t wait to get their names on them and start writing. By the time our meeting was done, we all knew a serious bond had been forged. We all hugged each other and they told me how much they were looking forward to our next meeting. Five of them even posed for a picture with me. I’ll be seeing them again this Sunday. We will be talking about health and wellness and the session will be led by the creator of Fresh 101 Detroit, Monique Dooley. Want to read about week 2? Click here.